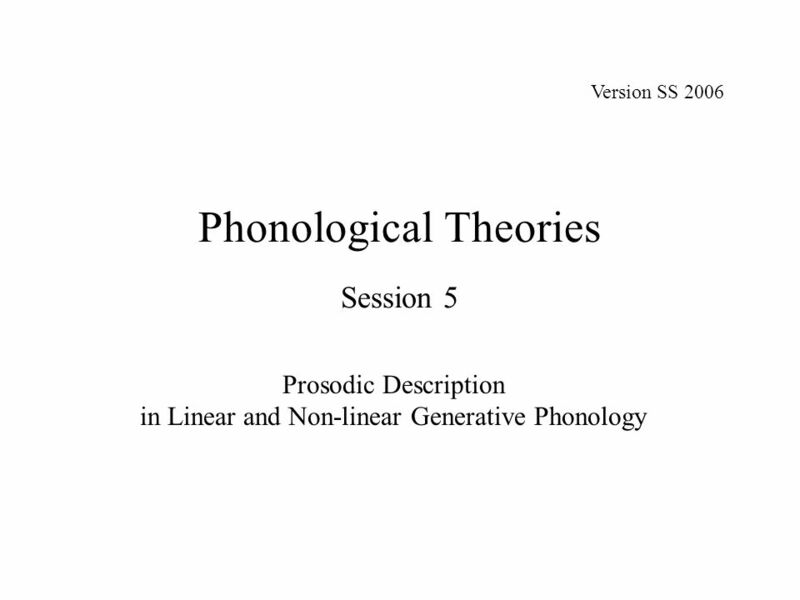 Phonological Theories Session 5 Prosodic Description in Linear and Non-linear Generative Phonology Version SS 2006. 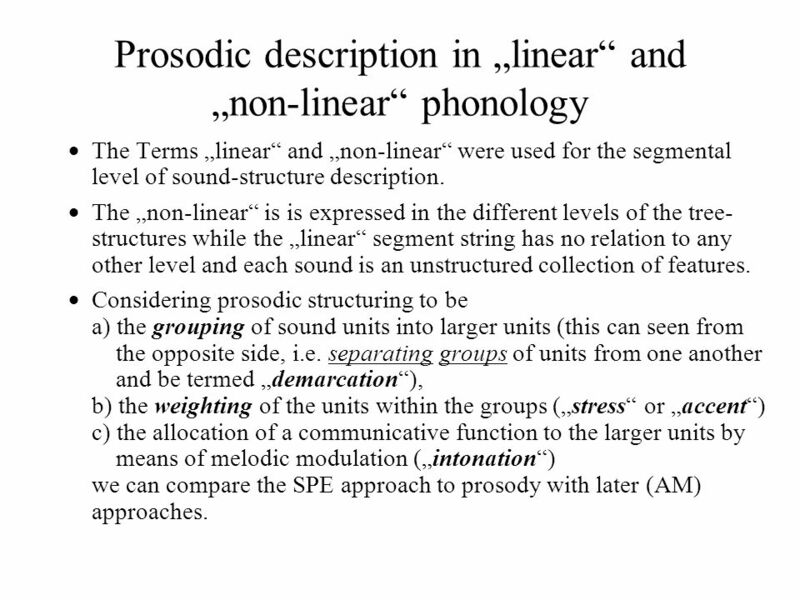 2 Prosodic description in linear and non-linear phonology The Terms linear and non-linear were used for the segmental level of sound-structure description. 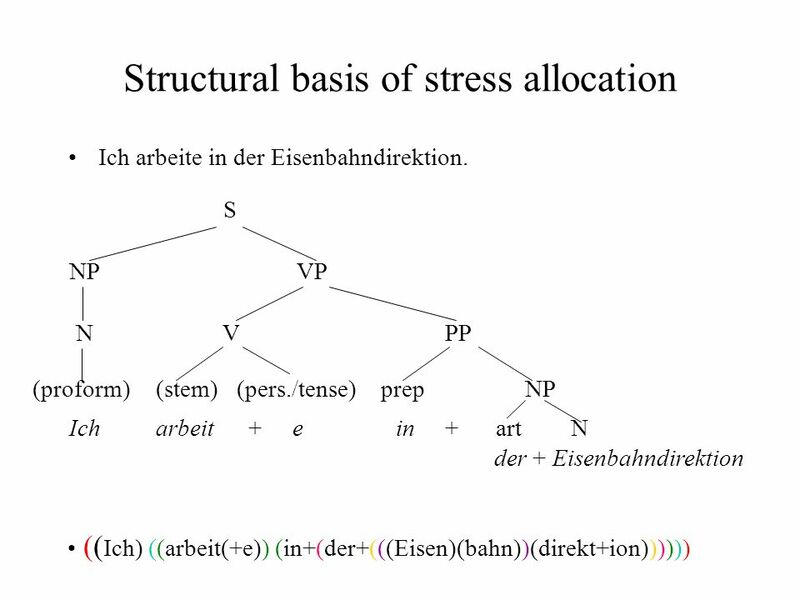 The non-linear is is expressed in the different levels of the tree- structures while the linear segment string has no relation to any other level and each sound is an unstructured collection of features. Considering prosodic structuring to be a) the grouping of sound units into larger units (this can seen from the opposite side, i.e. separating groups of units from one another and be termed demarcation), b) the weighting of the units within the groups (stress or accent) c) the allocation of a communicative function to the larger units by means of melodic modulation (intonation) we can compare the SPE approach to prosody with later (AM) approaches. 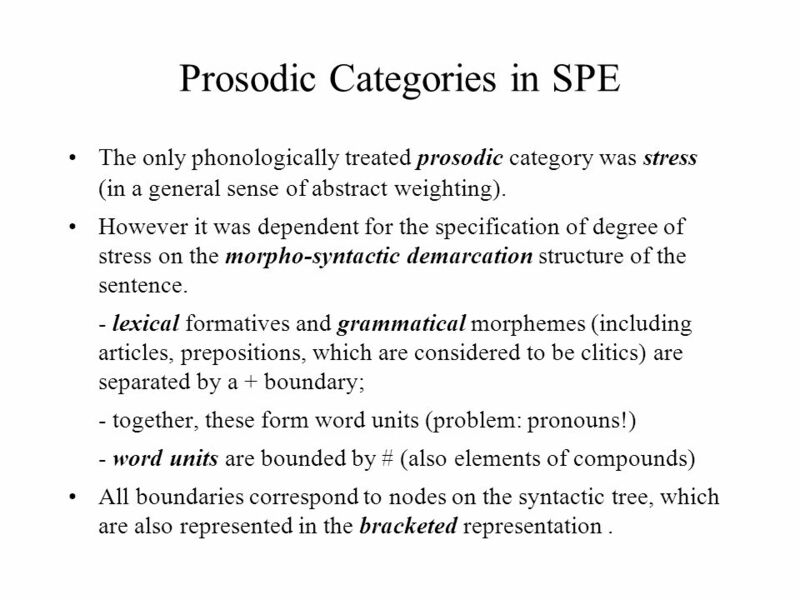 3 Prosodic Categories in SPE The only phonologically treated prosodic category was stress (in a general sense of abstract weighting). However it was dependent for the specification of degree of stress on the morpho-syntactic demarcation structure of the sentence. - lexical formatives and grammatical morphemes (including articles, prepositions, which are considered to be clitics) are separated by a + boundary; - together, these form word units (problem: pronouns!) - word units are bounded by # (also elements of compounds) All boundaries correspond to nodes on the syntactic tree, which are also represented in the bracketed representation. 6 Problems with cyclical stress allocation This is the cat that killed the rat that stole the cheese. ( SPE p. 372 ) The prosodic phrasing for the sentence is: 2 1 2 1 2 1 ( This is the cat) (that killed the rat) (that stole the cheese). 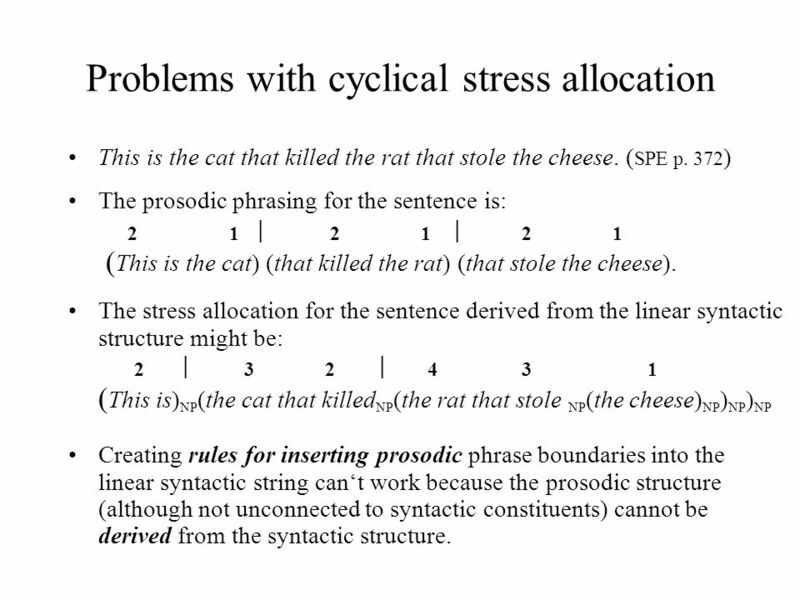 The stress allocation for the sentence derived from the linear syntactic structure might be: 2 3 2 43 1 ( This is) NP (the cat that killed NP (the rat that stole NP (the cheese) NP ) NP ) NP Creating rules for inserting prosodic phrase boundaries into the linear syntactic string cant work because the prosodic structure (although not unconnected to syntactic constituents) cannot be derived from the syntactic structure. 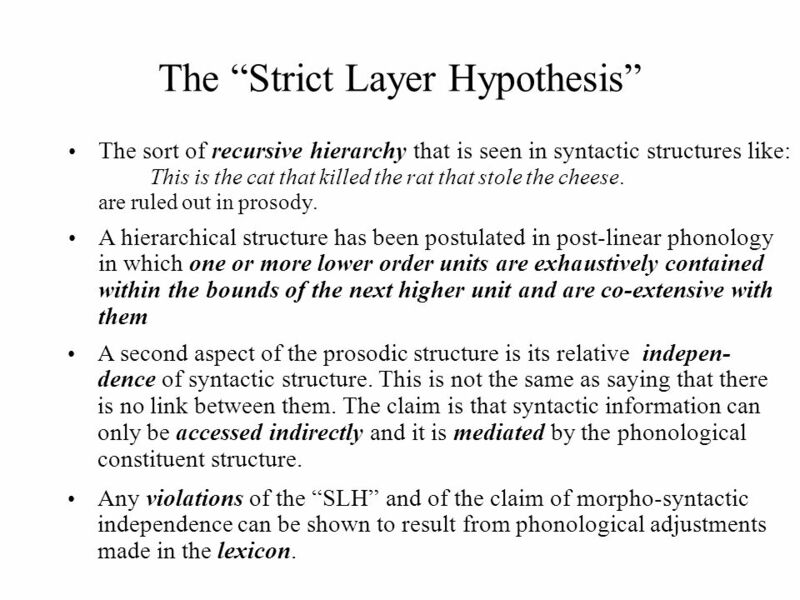 7 The Strict Layer Hypothesis The sort of recursive hierarchy that is seen in syntactic structures like: This is the cat that killed the rat that stole the cheese. are ruled out in prosody. A hierarchical structure has been postulated in post-linear phonology in which one or more lower order units are exhaustively contained within the bounds of the next higher unit and are co-extensive with them A second aspect of the prosodic structure is its relative indepen- dence of syntactic structure. This is not the same as saying that there is no link between them. The claim is that syntactic information can only be accessed indirectly and it is mediated by the phonological constituent structure. Any violations of the SLH and of the claim of morpho-syntactic independence can be shown to result from phonological adjustments made in the lexicon. 9 Some practice (or problems?) 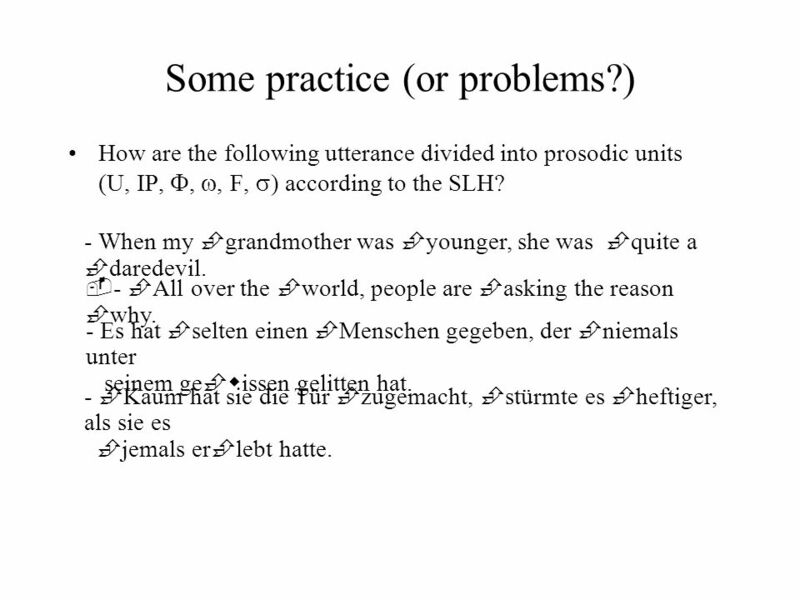 How are the following utterance divided into prosodic units (U, IP,,, F, ) according to the SLH? - When my grandmother was younger, she was quite a daredevil. - - All over the world, people are asking the reason why. - Es hat selten einen Menschen gegeben, der niemals unter seinem ge w issen gelitten hat. - Kaum hat sie die Tür zugemacht, stürmte es heftiger, als sie es jemals er lebt hatte. Download ppt "Phonological Theories Session 5 Prosodic Description in Linear and Non-linear Generative Phonology Version SS 2006." Computational language: week 10 Lexical Knowledge Representation concluded Syntax-based computational language Sentence structure: syntax Context free. Syntax. Definition: a set of rules that govern how words are combined to form longer strings of meaning meaning like sentences. Anders Holmberg CRiLLS.  The grammar of a language L: The set of categories, rules, and principles which relate sound to meaning in L  Speech sound. Dr. Abdullah S. Al-Dobaian1 Ch. 2: Phrase Structure Syntactic Structure (basic concepts) Syntactic Structure (basic concepts)  A tree diagram marks constituents. SYNTAX 1 DAY 30 – NOV 6, 2013 Brain & Language LING NSCI Harry Howard Tulane University. Models of Generative Grammar Smriti Singh. Generative Grammar  A Generative Grammar is a set of formal rules that can generate an infinite set of sentences. 1 Prof.Roseline WEEK-4 LECTURE -4 SYNTAX. 2 Prof.Roseline Syntax Concentrate on the structure and ordering of components within a sentence Greater focus.